This article is about the food. For other uses, see mashed potato (disambiguation). A small plate with a serving of mashed potatoes. 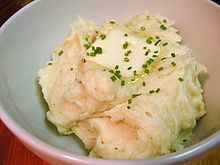 Mashed potato (British English) or mashed potatoes (American English and Canadian English), colloquially known as mash (British English), is a dish prepared by mashing boiled, peeled potatoes. Milk, butter, salt and pepper are frequently used in preparation and it is frequently whipped at the end. The dish is usually a side dish to meat and/or vegetables. The closely related smashed potatoes dish is made with unskinned potatoes and it is hand mashed and not whipped. Recipes for making the dish started appearing in 1747 with an entry in The Art of Cookery by Hannah Glasse. Dehydrated and frozen mashed potatoes are available in many supermarkets. 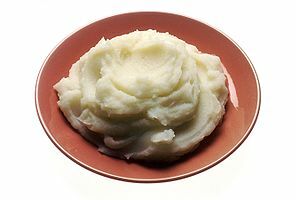 Mashed potato may be used as an intermediary ingredient for other dishes such as dumplings and gnocchi, in which case the potatoes may be baked or boiled, and may or may not have dairy or seasoning added. 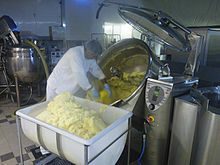 The use of "floury" types of potatoes is recommended, although "waxy" potatoes are sometimes used for a different texture. There are a multitude of "floury" types, but the most commonly known include russet, golden wonder, and red rascal potatoes. Butter, vegetable oil, milk and/or cream are usually added to improve flavour and texture, and the potatoes are seasoned with salt, pepper, and any other desired herbs and spices. Popular ingredients and seasonings include: garlic, cheese, bacon bits, sour cream, crisp onion or spring onion, caramelised onion, mayonnaise, mustard, horseradish, spices such as nutmeg, and chopped herbs such as parsley. One French variation adds egg yolk for pommes duchesse or Duchess potatoes; piped through a pastry tube into wavy ribbons and rosettes, brushed with butter and lightly browned. Pomme purée (potato puree) uses considerably more butter than normal mashed potato - up to one part butter for every two parts potato. In low-calorie or non-dairy variations, milk, cream and butter may be replaced by soup stock or broth. Aloo Bharta, an Indian sub-continent variation, uses chopped onions, mustard (oil, paste or seeds), chili pepper, coriander leaves and other spices. 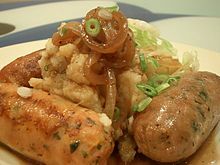 A plate of sausage and mashed potatoes, with cabbage and onion gravy, commonly known as "bangers and mash"
Mashed potato can be served as a side dish, and is often served with sausages in the British Isles, where they are known as bangers and mash. Mashed potato can be an ingredient of various other dishes, including shepherd's and cottage pie, pierogi, colcannon, dumplings, potato pancakes, potato croquettes and gnocchi. Particularly runny mashed potatoes are called mousseline potatoes. In the United Kingdom, the cold mashed potato is mixed with fresh eggs and then fried until crisp to produce the potato cake. This dish is thought to have originated in Cornwall and is a popular breakfast item. When instead combined with meat and other leftover vegetables, the fried dish is known as bubble and squeak. A popular accompaniment to mashed potatoes in the United States is gravy. The most common forms of gravy paired with mashed potatoes are beef gravy or turkey gravy, though vegetable gravy is becoming more common as the vegetarian and vegan trends see a rise in popularity. A potato masher is a utensil which can be used to prepare the potatoes, as is a potato ricer. They may also be whipped with an electric hand mixer, or with sufficient boiling, can be mashed effectively with a durable wooden spoon and brute force. ^ a b Smith, A. (2011) Potato: A Global History. London: Reaktion Books. ^ a b Cloake, Felicity (15 March 2010). "What's the best mashed potato method?". The Guardian. London. ^ Randal, Oulton, (7 October 2004). "Floury Potatoes". CooksInfo.com. ^ "Best Mashed Potato Recipes and Toppings - US Potato Board". Potatogoodness.com. Retrieved 16 April 2018. ^ Eppich, Kristen (18 April 2013). "Best mashed potato recipe in the world". Chatelaine.com. Retrieved 16 April 2018. ^ a b Dupree, Nathalie (1 November 2012). Mastering the Art of Southern Cooking. Gibbs Smith. ISBN 978-1-4236-2316-8. ^ Commercial America. The Philadelphia Commercial Museum. 1910. p. 27. Retrieved 9 January 2017. ^ Simmons, M.; Table, Sur La (2008). Things Cooks Love: Implements, Ingredients, Recipes. Andrews McMeel Publishing. p. 133. ISBN 978-0-7407-6976-4. Retrieved 9 January 2017. 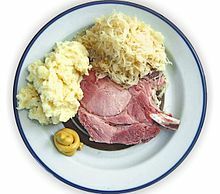 Wikimedia Commons has media related to Mashed potatoes.